I have made this dish twice now and I find it amazing. All the flavours work so beautifully together. I first saw it on the AWW Christmas special, another Julie Goodwin recipe, then I went out and bought the magazine for the recipe and just had to try it. The recipe is to bake it in the oven, but we actually bake it in our gas barbecue (as my oven is not big enough to bake this big fish in). My husband has mastered the barbecue and knows how to bake fish perfectly. Also the recipe states to use a 2.4kg ocean trout, yesterday we used a 2.7kg ocean trout and followed the same cooking time and it was still perfect. The oil to use for the sauce is a light flavoured oil, like light olive oil, sunflower, vegetable or canola oil. This is a really easy recipe with an amazing result. Remove the fish from the refrigerator 30 minutes before baking. Rinse under cold water, pat dry with paper towels. Preheat you oven to 180C (160C fan forced). If using your barbecue, preheat to 180C. Place a length of extra-wide heavy-duty aluminium foil onto a large oven tray- the foil needs to be longer than twice the size of the fish. 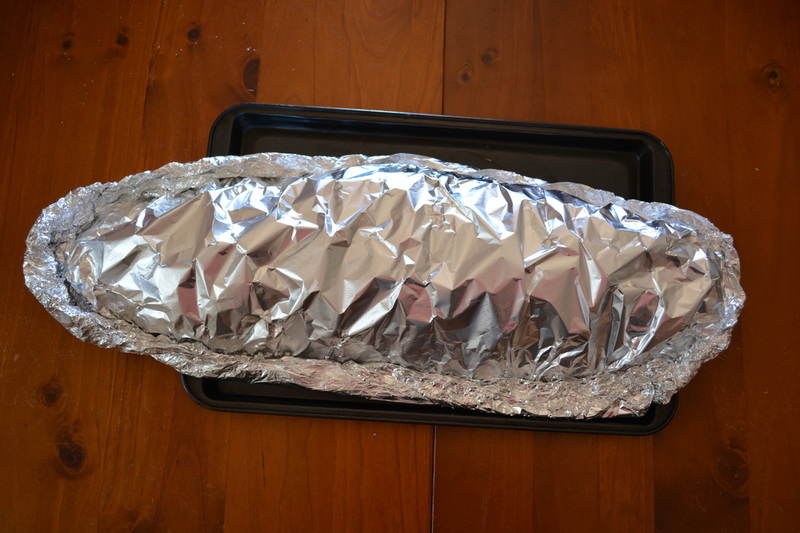 Place a piece of baking paper on the aluminium foil, make the baking paper the same size as the aluminium foil. Place the fish on the baking paper over the baking tin section. Season the fish with salt and pepper all over, including in the cavity. Fill the cavity with the lemon, parsley, onion and peppercorns. If there are any green tops on your fennel, reserve half for garnish. Chop the remaining tops finely and add to the fish cavity. Bring the foil up around the fish, then pour over the wine. Wrap the fish in the foil, carefully crimping the edges together to seal. Be careful not to tear the foil. Bake the fish for 40 minutes. Then turn the oven/barbecue off and leave the fish, still sealed in the foil, in the closed oven for a further 20 minutes. Cut the pomegranate in half and remove seeds from the flesh. Sweet Fennel and Mustard Sauce: While the fish is baking, make the sauce. Put the fennel and mustard seeds into a small food processor or blender. Add the sugar, salt, egg yolk and lemon juice. Blend to a thick paste. Pour the mixture into a medium sized bowl. Slowly whisk in the oil until you have a thick sauce. Season to taste with pepper. If it is too thick, dilute with a tablespoon of water, if needed. To check if the fish is done, you can tear the foil near the head, if the eye is white, your fish is done. 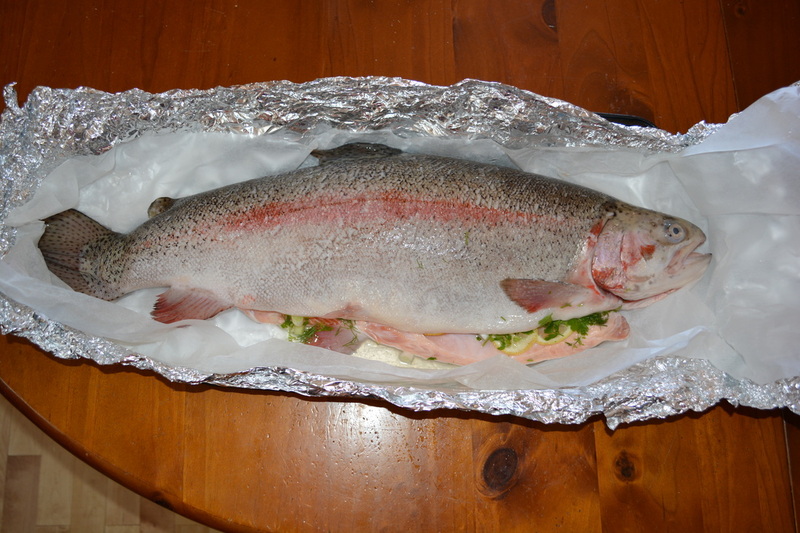 Undo the foil and carefully transfer the trout to a serving dish. 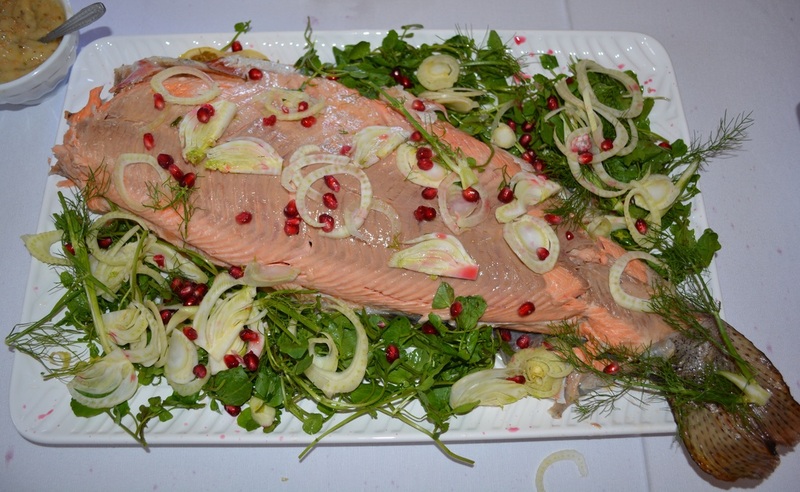 Peel away the skin from the top of the fish (it comes off easily) and cover with the shaved fennel, pomegranate seeds and reserved fennel tops. Arrange the watercress sprigs and lemon wedges around the edge of the fish. Serve the fish with the Sweet Fennel and Mustard Sauce.